Hopefully. Sorry it took so long to getting around to addressing this. Maybe there should be a choice of buttons - 'meh', 'ok', or 'great!' - depending on one's opinion of the box contents, and enabling the devs to keep an eye on customer satisfaction levels. Opened my first improved box today. I got two green crafting kits, the Blackout mask, and a Premium Key! So I've completed several Bounties since they were revamped - so far I say nice job Con, definitely happy with the new rewards. Though I have to ask - have Ammo Caches been removed? I haven't seen one since the change - and for my lower accounts they were definitely welcome, so I imagine others' found them to be the same. I have been getting more rares from infected bounties. Edited by Scrub McLordington LXIX, 27 September 2015 - 07:13 PM. i've got a green craft kit a rare LR and a bit of fuel. Since the change in the infected bounties I feel that the difficulty in the task has increased, but because of the new prizes I think is fair for it to be harder. But why remove the ammo caches from the infected bounties? The caches were the only way for me to get ammo to do my alliance tasks faster and focus only in looting weapons. If this is for the best of all the players I can live without them, but if this has been made for another reason I will like to request to put them back to the infected bounties. i wish level 10+ would get a fuel reward for completing a bounty kill even if they dont open the bounty box...... sigh im low on fuel and someone would just go and raid me because i have a fuel generator which is just "GREAT"
Today's bounty box. I am not complaining, just showing it. for some reason im still getting crap. its a bunch of meds, some nades, and nothing good like fuel or keycard or good prem cloth. In my 5 box total. just that I forgot the exact stuff. So, overall impressions so far: I've had a few Bounties that yielded crap (3x Green Kits and a blue weapon), but far from the near-uniform crap that was the previous rewards. Generally the rewards are better - I've received several lvl 3 keys, 1 Premium key, and several tokens of varying hue, including two unique ones. Fuel rewards don't seem as prevalent as some peoples', but definitely more than was true before. I really like the changes you guys have made Con and Co.
Now, for the negative: I would recommend allowing no more than two slots worth of green kits - three seems a touch high. I'd remove Rare weapons entirely, and replace them with Infamous Components (which I imagine almost all end up as anyway). And please, please, please bring back the Ammo Caches! This relatively insignificant item is one of my favorite additions that you guys have made to the game, and I know other players are sorry to see them absent as well. Again, overall impression: very nice changes, thank you. 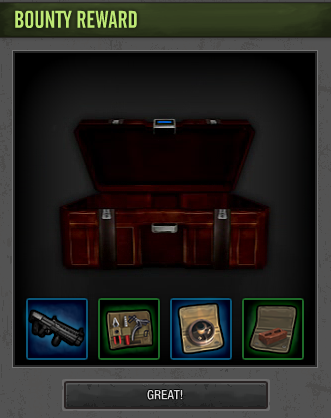 With all survivors above lvl 50, what's the point of still getting lvl 45 blue items ? I would prefer even a green kit that might one day find some use in a crafting session, than an item that will be automatically (with no possible exception at this level) recycled. Adding research notes in bounties would be a way to balance their low drop rate. This has already been suggested several times, I'm just adding my feedback. Edited by Ronan, 05 December 2015 - 11:20 AM. What about one of the slots being something of your choosing, obviously not prem keys or fuel. But make it so that you can choose if you want a weapon every bounty box, then one of the slots is always a weapon, or maybe armor, or active gear, or meds etc etc. Probably not that useful as all that really matters from bounty boxes are the prem keys and fuel, but it might make it a bit more bearable when you always get something thats even somewhat useful to you. EDIT: Things have already been changed for the better but this may still be a fun addition. Edited by Andre Kroon, 07 April 2016 - 08:25 PM.